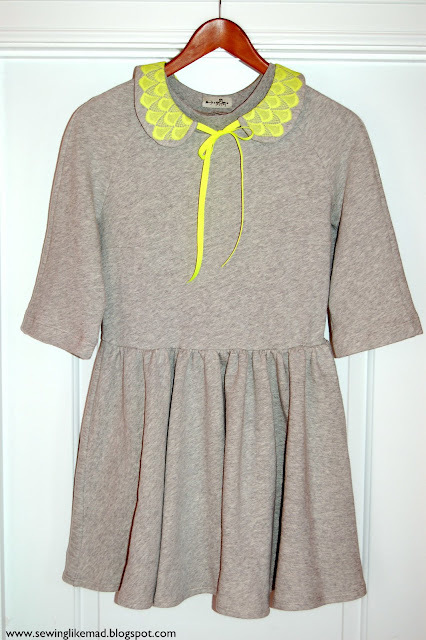 Sewing Like Mad: Free printable separate Peter Pan collar pattern. Free printable separate Peter Pan collar pattern. Today I am trying something new on this blog. 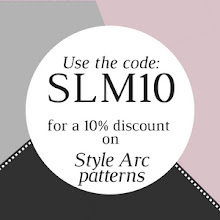 A FREE printable pattern. I have had many things I wanted to share with you since I started this blog almost a year ago but have kept back because I have no idea how to do draw patterns any other way than by hand and since I make no money doing this blog paying someone else for a free pattern also seemed a bit silly. But lately I started thinking that you was probably going to be more happy with a amateur looking (but professionally drafted) sewing pattern than no pattern at all, right!? Well, at least that was my conclusion so here we go. The pattern is for a really cute (or cool depending on fabric choice) separate Peter Pan collar. Remember when I made these three dresses for my niece (click HERE for a reminder). Well, my sister wanted one too. And she really wanted one in a classic grey sweatshirt fleece (I found some french terry and that worked too) and no matter how many suggestions I came up with to add more color she just really wanted one color. And the 'customer' is always right, right! Plus I knew she was right, it was going to be great, it is just me and my color obsession that is the problem (can also be read about in the post I previous linked to). So what does a desperate color freak do? Suggest a separate collar with another brand new obsession neon colored lace. And this time I got a go from my sister. The sewing of the collar is so easy it is almost ridiculous so I thought I would show you how you get a straight piece of lace to fit a round collar. First step is to pin your preferred placement of the outer line of the lace on the collar. 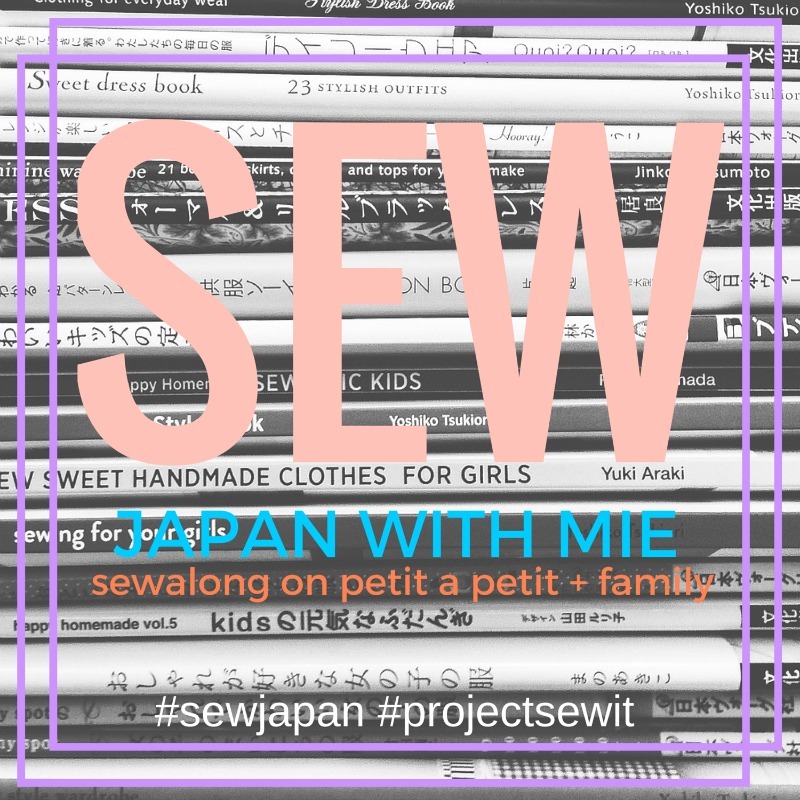 Remember to leave room for the sewing allowance! Then I cut off the extra lace on the inside seam and sewed a gathering thread 0.5 cm from the edge. I only used one because it only requires a bit of gathering to make it fit plus I didn't actually wanted any visible gathering. I just wanted to fit the smaller circumference that the inside of the collar obviously has. Oops I must have skipped a step in the photography while sewing. Before I put the inner and outer collar right against right and sew all the way around and leaving a small gap center back in the inner seam - as you can see on the above photo - I simply stitch the outer line of the lace to the collar. Which is by the way quite easier than I expected. You can see it on the close up photo of the finished collar further down in this post. Oh, and just ignore the snap there....an experiment that did not really work. And this post is long enough already without getting into that little mishap. AND I also totally forgot another thing....not only photographing it but completely doing it. 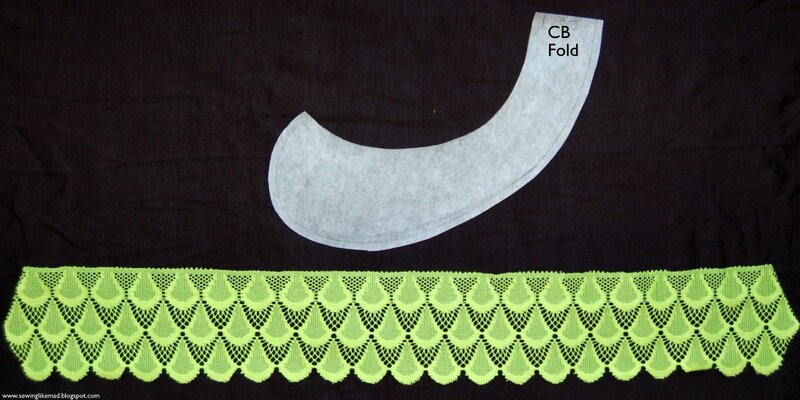 Making a smaller inner collar to prevent the finished collar to bend/stick out from your body when you are wearing it. (Don't worry Sis yours is for some lucky reason not doing it). But since I am already working on another one (a bit different shape but same technique) we are quickly going to jump to some photos from that project before we go back to my sister's collar and dress. I want to show you a trick I learned from my boss when I was a seamstress trainee. Normally you actually draft two collar pattern pieces - an inner and an outer - with the inner being a bit smaller. But with this trick you can just cut your outer collar pattern double/twice. Sew the outer seam first and here comes the trick. Slide out the inner collar like 3-5 mm mostly in the back area as you can see on the photo above. Here you can see a close up of the inner collar peaking out. Now cut that off and either close up the collar if you are making a separate one or pin/sew it to the garment you are working on. Here you see a photo of the back side of the collar. The back side is now smaller and will prevent to finished collar to bend/stick out when wearing it. (Thanks former boss Joan). And here we are finally at the end. 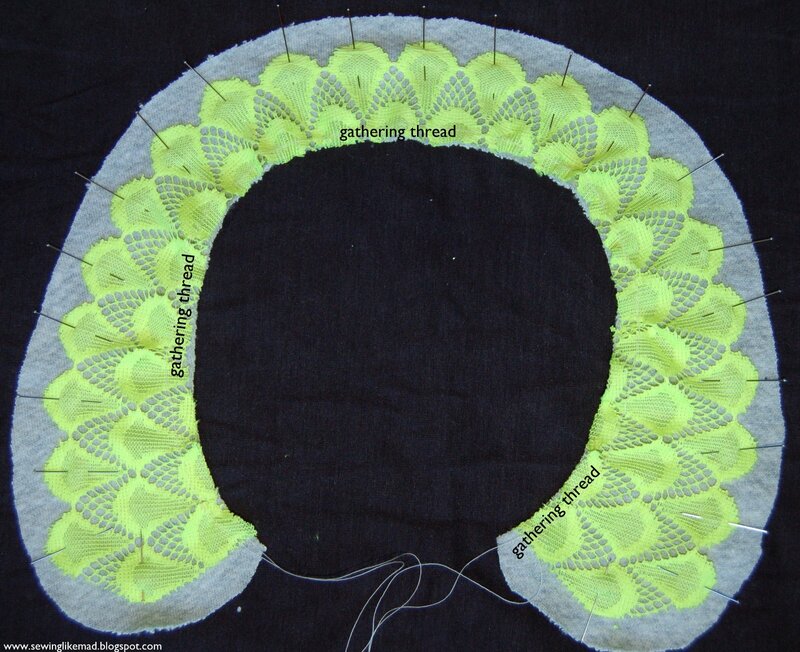 A separate collar with added neon lace and neon grosgrain ribbons as tie bands. And a view from the back. And I don't want to you miss a view of the whole dress. I absolutely love it and it was hard for me to put it in the envelope so I could ship it to my sister. It is SO soft and crazy comfortable. She should receive it any day now. I am definitely going to make one for myself too. Oh my goodness! This is so cute! Thanks for linking up to Monday Funday! Gorgeous collar!! I love the neon lace with the gray! I love this collar it is so cute! You did a fabulous job! I would love for you to share on weekly link party Blog Stalking Thursday. Gorgeous! This is great!! Just what I need for some Summer sewing coming up :-) Pinning now to my Stitching and Sewing board! Thanks for posting. This is darling! I totally want to make a bunch now! I love that collar! I like the pop of color! I have been wanting to make a Peter Pan collar for myself. Thanks for the pattern! Thank you so much for sharing this great tutorial. I'd love to give it a try, so I pinned it. Thanks for linking up at Gingerly Made's Show & Tell party. You've been featured!! I love it!! That grey dress is too beautiful. Thank you for this pattern! I'm making a dress for my teen daughter. She doesn't like the collar of the pattern; she wants a peter pan collar. This pattern is just what I needed! Thank you for this pattern. I'm making a dress for my teen daughter. She doesn't like the collar of the dress; she wants a peter pan collar. This pattern is just what I needed. Thank you! All my favorite things in one top! Hopscotch dress - tunic version. Oliver+S Ice Cream Dress with lace and piping.